The Dialogue Society kindly invites you to our Iftar Dinner event on Wednesday, 29th May 2019 at 5 Birch Road, Sheffield S9 3XL. It would be a great pleasure for us to have you at our event. sheffield@dialoguesociety.org by Wednesday, 15th May 2019. Members should have received individual invitations and agendas, but all are welcome, both those who have previously been members and newcomers. 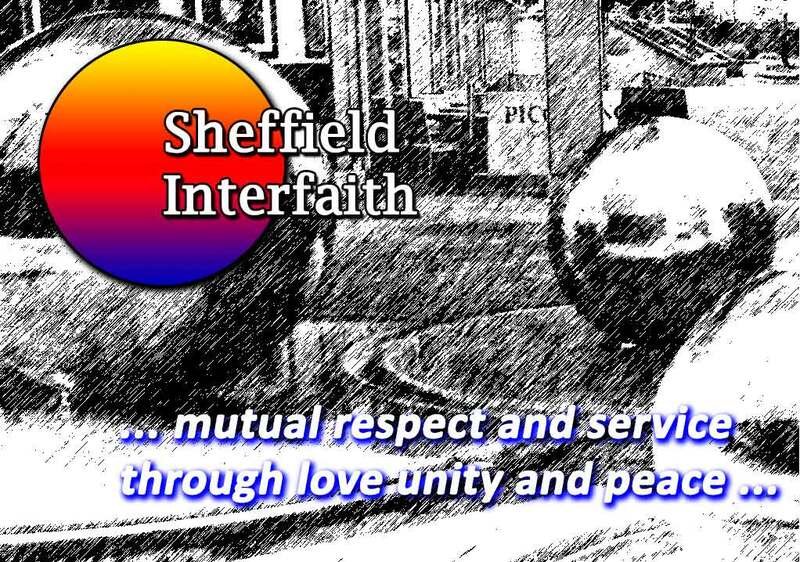 Sheffield Interfaith (SIF) consists of local people who are working together to promote mutual respect and interfaith dialogue in Sheffield. We achieve this by getting to know each other at regular ‘Food and Friendship’ dinners and annual interfaith walks. . Individual membership of SIF is £5 per year, and a faith group or congregation can join for £15 per year. What can we do about terrorism, racism, anti-Semitism, Islamophobia and fundamentalism? Let’s try making friends and learning about each other. Join us for a bring and share, mostly vegetarian, meal. Following a successful lunch at Upper Chapel in March, the next Sheffield Interfaith Food and Friendship bring and share dinner will be back at Shirley House next Wednesday (sorry for the short notice) 3rd April. We hope to arrange further lunch gatherings in the City Centre, but no dates are yet arranged. There will be no ‘Food and Friendship’ meals during May due to Ramadan, which begins around 5th May and lasts for 4 weeks. Sorry there are so many events on the 18th and 19th March- here’s another. Feature film about the headstrong 18th century Christian preacher John Wesley from Epworth, Lincolnshire and his spiritual struggles that led to the founding of the Methodist church. Based on his own journals. At our last AGM people suggested both that we should hold our bring and share Food and Friendship meals in different places around the city and that we should try holding them at lunchtime instead of evenings. So we are very grateful to the Unitarians of Upper Chapel, Norfolk Street, in the City Centre of Sheffield, who have invited us to use their premises in March. The format will be the same, please bring some food to share (hot or cold, savoury or sweet, mostly vegetarian), if you are able. There’s no need to book, just come and meet people. You are warmly invited to hear presentations by Mrs Christine Jackson and Dr Ismail Mesut Sezgin, with opportunity for questions and discussion. The Prophet Muhammad said “Only an honourable man treats women with honour and integrity, and only a vile and dishonorable man humiliates and degrades women.” Being a Muslim is often more than a religious identity. In order to have a deeper understanding of the real role of women in Islam, diverse perspectives on gender and women in Islam, and how Islam personally treats to women, we are holding a seminar with the participation of Dr Chris Hewer on Monday, 18th February 2019 at our community building in Attercliffe, Sheffield. We will have the special opportunity to listen to his insights and thoughts on women in Islam. The event will start at 6.30pm and will consist of two sessions and a refreshment break. We kindly invite anyone who is interested. We also believe that such events give us the opportunity to get together and get to know new people. Therefore, everyone is welcome. The event is free of charge. Dr Chris Hewer comes from a background in Christian theology, education, Islamic studies and inter-faith studies and has worked in the field of Muslims in Britain and Christian-Muslim relations since 1986, first at the Centre for the Study of Islam and Christian-Muslim Relations at Selly Oak in Birmingham and from 1999 to 2005, as the Adviser on Inter-Faith Relations to the Bishop of Birmingham. From 2006-2010, he was the St Ethelburga Fellow in Christian-Muslim Relations in London, with a brief to deliver adult popular education courses, study days and talks around Greater London. His current work is to teach study days and residential courses, to develop written and electronic resources and to be available for consultation. Sunday 10th Feb 1-3pm @ St Mary’s Women’s Interfaith Forum. We shall be reflecting on the Common Good. Women of all faith traditions and none are invited to share a safe space of conversation and learning together. Please bring vegetarian food to share, refreshments will be provided. For more information contact Rev. Claire Dawson claire.dawson@sheffield.anglican.org or Maryam Akhtar minhajsisterssheffield@gmail.com .